Adrian Musolino (V8X) and Andrew Clarke (V8X) look back at the Sydney Motorsport Park and the Championship implications. On the White Flag Lap, Glenn Matthews talks about the V8’s returning to the track and their plans for the future of the Sydney circuit. Lachlan Mansell (Winton) and Garry O’Brien (Auto Action) look at the Sydney Motorsport Park return of the Championship and discuss what the NRL TV deal could mean for the V8 Supercar media rights. Richard Craill (Speedweek) and Chris Jewell (V8SC) look at the Night Racing, Marcos Ambrose NASCAR victory and should Jacques Villenuve get a V8 Drive over a young up and coming driver. On the White Flag Lap, Rick Kelly talks about the year so far and his hopes for 2013. Mark Fogarty (AutoAction – SMH & The Age) and Peter Norton (Inside Motor Sport) review the Ipswich 300 and Triple 8’s testing of the Car of the Future. On the White Flag Lap, Drivers talk about what pressure social media is placing on them. 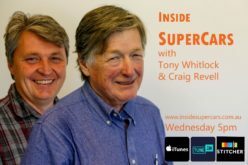 Richard Craill (Speedweek) and Tom Worsley (Freelance) Preview the Ipswich 300 and look at Triple 8’s new Red Bull sponsorship announcement as the team gets their Car of the Future on the track first. On the White Flag Lap, Russell Ingall talks about equaling Peter Brock’s all time event starts.